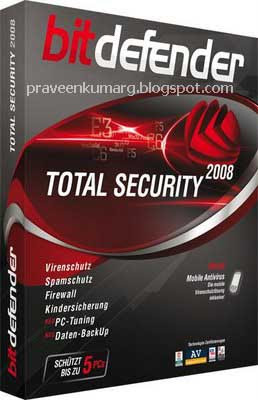 BitDefender Total Security 2008 provides the ultimate protection for your PCs, protecting you from virus, spam, spyware, identity theft and all other internet attacks. The integrated Firewall keeps you hidden from attackers, while protecting your WiFi. Parental Controls and our new Gamer Mode, are must for every family. In addition, System Tune-Up takes care of system maintenance to keep your PC running at top speed while Simple Back Up ensures your data is secure.